Auburn University’s National Center for Additive Manufacturing Excellence, or NCAME, has formed partnerships with Huntsville City Schools and the U.S. Army Aviation and Missile Research, Development and Engineering Command, or AMRDEC, to further education and workforce development in the field of additive manufacturing from high school through graduate-level training. A signing ceremony to commemorate the partnerships was held Oct. 25 at Jemison High School, the site of one of two EOS M290 metal 3D printers owned by Huntsville City Schools. The second printer is located at Grissom High School. Auburn’s collaboration with the district will enable high school students and teachers to receive additive manufacturing training from its NCAME researchers at the high schools on their own machines. Auburn has a rich history of additive manufacturing research and development and was selected recently by ASTM International as one of the founding partners for a new Additive Manufacturing Center of Excellence. In conjunction with NASA, the Auburn center was created to advance fundamental and applied additive manufacturing research through public and private partnerships and contribute to workforce development. “This extraordinary public-private collaboration will help to grow tomorrow’s advanced manufacturing workforce. NASA and the private sector will benefit from the resulting STEM-oriented workforce that is necessary for American innovation and competitiveness in additive manufacturing,” said John Vickers, principal technologist of the Space Technology Mission Directorate at NASA. A core piece of the center’s mission is to advance STEM—Science, Technology, Engineering and Mathematics—disciplines by engaging students and teachers in opportunities; investigate and develop technologies; and share facilities, capabilities and technical expertise. Additional high schools, community colleges and universities across the state may become partners with Auburn in the future. 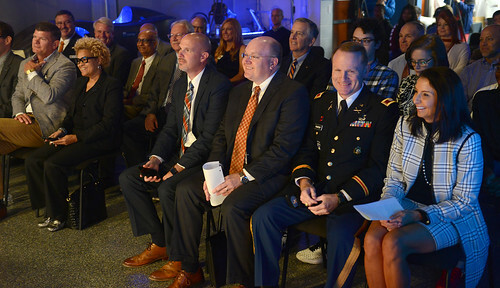 Auburn’s collaboration with the U.S. Army Aviation and Missile Research, Development and Engineering Command will also encourage student interest in STEM disciplines and recruit the next generation of scientists, mathematicians and engineers. The team will work together to strengthen student and educator STEM capabilities and maintain a strong base to enhance the caliber and pool of talented graduates. 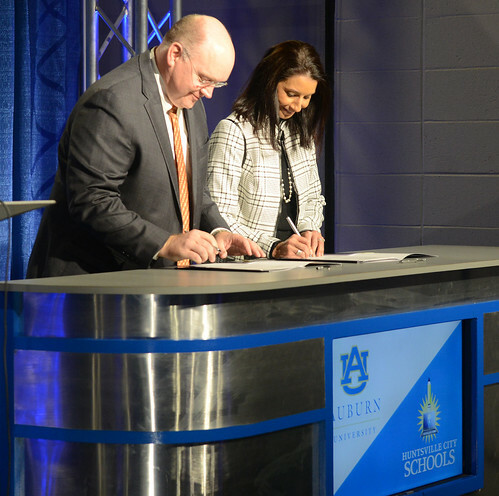 Auburn engineering dean Christopher B. Roberts signs the memorandum of understanding with Huntsville City Schools superintendent Christie Finley. Auburn engineering dean Christopher B. Roberts visits with Col. Eric Rannow of the U.S. Army Aviation and Missile Research, Development and Engineering Command after signing the educational partnership agreement. Representatives from Auburn University’s National Center for Additive Manufacturing Excellence, Huntsville City Schools and U.S. Army Aviation and Missile Research, Development and Engineering Command gathered Oct. 25 to create a partnership on additive manufacturing, or 3D printing. 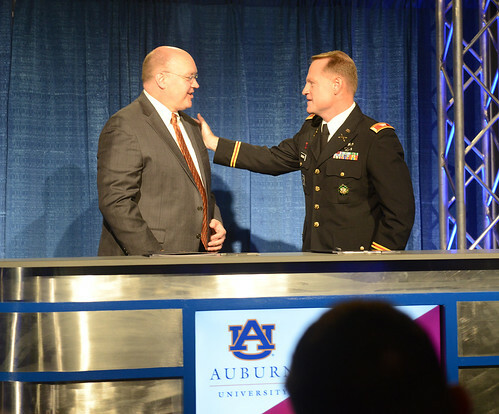 Auburn University has formed partnerships with Huntsville City Schools and the U.S. Army to further education and workforce development in the field of additive manufacturing, or 3D printing. 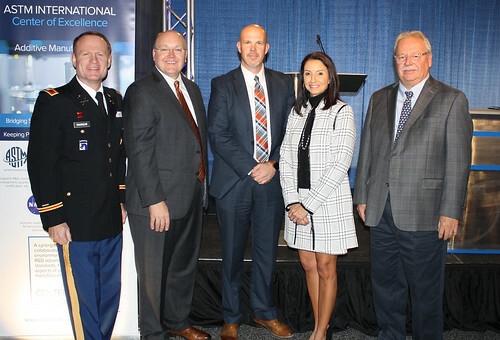 Pictured, from left, are Col. Eric Rannow, military deputy at the U.S. Army Aviation and Missile Research, Development and Engineering Center; Auburn engineering dean Christopher B. Roberts; Todd Watkins, director of career and technical education at Huntsville City Schools; Christie Finley, superintendent of Huntsville City schools; and John Vickers, principal technologist of NASA’s Space Technology Mission Directorate.